(Nanowerk News) Named for the mythical god with two faces, Janus membranes — double-sided membranes that serve as gatekeepers between two substances — have emerged as a material with potential industrial uses. Creating two distinct "faces" on these delicate surfaces, however, is a process fraught with challenges. 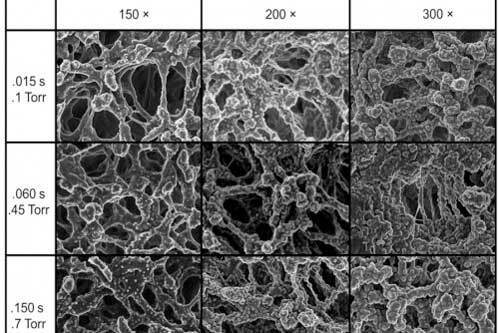 By applying a common high-tech manufacturing technique in an uncommon way, researchers at the U.S. Department of Energy’s (DOE) Argonne National Laboratory have discovered a new way to chemically deposit a second face, resulting in Janus membranes that are more robust and precisely structured than previous incarnations. 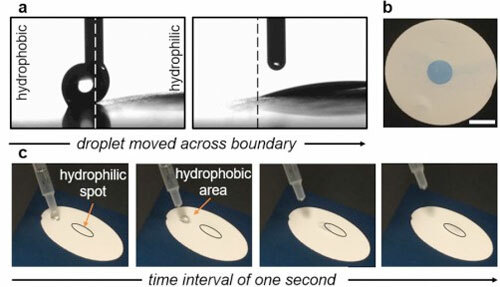 The two-sided “Janus membrane” material shown here could help optimize or enable a wide range of industrial processes, from treating wastewater to making biofuels. Recently described in an article in Advanced Materials Interfaces ("Janus Membranes via Diffusion-Controlled Atomic Layer Deposition"), the patent pending technology could help optimize or enable a wide range of industrial processes, from treating wastewater to making biofuels. According to Argonne’s Seth Darling, Janus is also the Roman god of passages, making the name even more apt for these membranes that mark the boundary between substances — conveying gas bubbles into liquids, for example, or separating oil and water. Darling is a scientist in Argonne’s Center for Nanoscale Materials (CNM) and director of the laboratory’s Institute for Molecular Engineering (IME), the Argonne-based partner to the University of Chicago's Institute for Molecular Engineering, of which he is also a fellow. According to Darling, the Janus membrane research is part of a broader effort at Argonne to advance a "new water cycle” for society, in which water would be treated and reused as many times as possible before being released back into the environment. There's a whole library of materials that could be used to create new Janus membranes, notes Darling, and each would have different properties and offer potential for myriad new applications. Waldman was investigating how ALD would affect membranes and noticed that the aluminum oxide was not fully coating the membrane’s bottom side. After consulting with Hao-Cheng Yang, an expert on Janus membranes and a postdoctoral appointee working with Darling at the CNM, Waldman decided to see whether this one-sided deposition could be optimized to achieve the partial layering needed for Janus membranes.